I did something that made me very happy this weekend. I made my first caprese themed recipe of the year. Ok, fine I guess it’s not my first since last August. I did make these awesome Roasted Asparagus Caprese Melts with a Fried Egg, but it’s been a few months and fresh spring produce is finally starting to pop up in the grocery store! My very, very favorite summer herb is basil and very, very favorite way to use it is in a caprese salad. Obviously, I am very, very excited to tell you guys about it! During the summer months when I was younger and my family lived in Cleveland my dad would grow bush basil out the yazoo. Really, he had four or five pots of basil. He would try and grow tomatoes and peppers and other veggies, but the stupid ground hogs that ruled our yard pretty much just showed him who was boss every summer. The last couple summers we were home in Cleveland he gave up on the other veggies and just did the basil out of the pots, but as long as we had the basil we were happy. Every night he’d send me outside to pick the basil to garnish whatever we were having for dinner that night. Pizza and pasta were our favorites and I will never forget the way the fresh basil smelled when it hit that hot dish. Ah, that smell is the smell of summer to me. It’s fresh and clean and will always remind me of my dad and how he’d try and show me how to properly pick the basil of the plant so it would continue to regrow. I never learned. Before the bossy groundhogs took over our yard my dad grew tomatoes, grape tomatoes. And they were good and to this day they are still my very favorite tomato. I think they’re one of the most flavorful tomatoes around and I used to love when he would walk up from the back yard with a handful of just picked grape tomatoes. Now it was normally only just handful, like I said sometimes they turned out and sometimes they got eaten by the dear or whatever the heck decided to venture into our backyard. He would always give my mom and I the first handful and we’d chow them. Just popping them in one after another until they were gone. Normally mom would bail out early cause she’s got a week stomach and say’s it hurts if she eats veggies on an empty stomach. Well, lets just say that is not the case for me or my dad. No, we’d pop those things till every last one was gone. Anyway, I am obviously a freak about basil and tomatoes. Which is why I am so excited to tell you guys about this recipe. For one, it is SO easy. That is what a caprese salad is all about easy and simple. Three main ingredients, some olive oil, salt and pepper. I guess I kind of stepped it up a notch with the grilled mushrooms and balsamic glaze, but it’s good and they are pretty fun, and I never do mushrooms. Like never. It’s not that I don’t like them. I just don’t love them, but oh my gosh. When I grilled them it was like magic. They were so good! I love the grill, it gives everything such great flavor and ah no dirty crusted dishes. Score! My mushrooms were really small. Like teeny, tiny little guys. Almost too small to stuff, but they were all my grocery store had. If you guys are making these as appetizers try to find medium size ones and if you’re making them as a side just use the big portabellas. They take you just a little less time to stuff. Really though, who knew stuffed peppers could be so cute? Um… not me. This is my very first stuffed mushroom and I am now hooked. Watch out mushrooms, I am coming for you! Wow, my cheesiness is getting worse. Oh and the balsamic glaze, you have to do this. It’s so good and just ties the whole thing together. Beware though, if you have kids, brothers, husbands or really anyone adverse to the smell of vinegar, trust me they are going to complain about the smell. Like all day. My family is a bunch of babies. This is my very first stuffed mushroom and I am now hooked. Watch out mushrooms, I am coming for you! Add vinegar and brown sugar if using to a small saucepan and bring to a boil. Reduce to a very low simmer and cook for 10-15 minutes, until liquid reduces by about half and is slightly syrupy. Remove from heat, pour vinegar in a bowl or glass to pour, and set aside to cool and thicken. 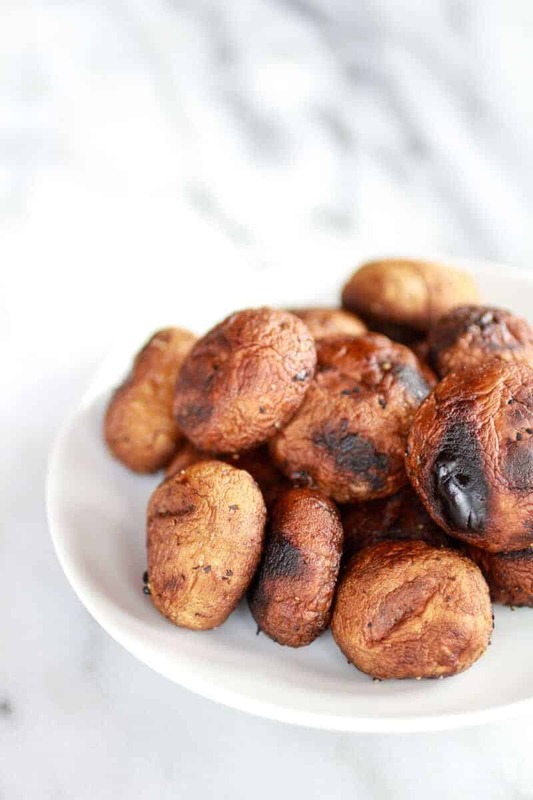 Preheat the grill to medium high heat or heat your oven to to 400 degrees F.
Toss the mushrooms with 1 tablespoon of olive oil and a sprinkle of salt and peper. Place the mushrooms stem side up directly on the grill and grill for 8-10 minutes or bake for 8-10 minutes. Remove from the grill and dump any liquid that is in the caps. 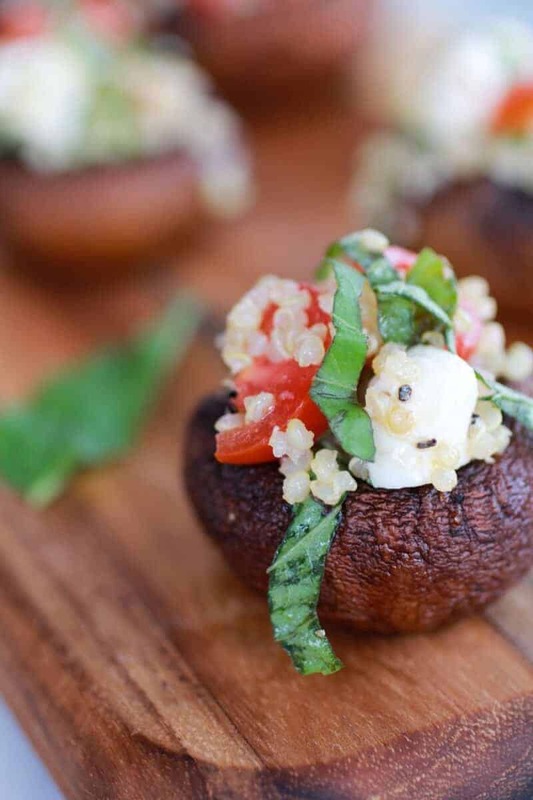 While the mushrooms grill toss the quinoa, tomatoes, mozzarella and basil together in a medium size bowl. Add the remaining olive oil. Season with salt and pepper. 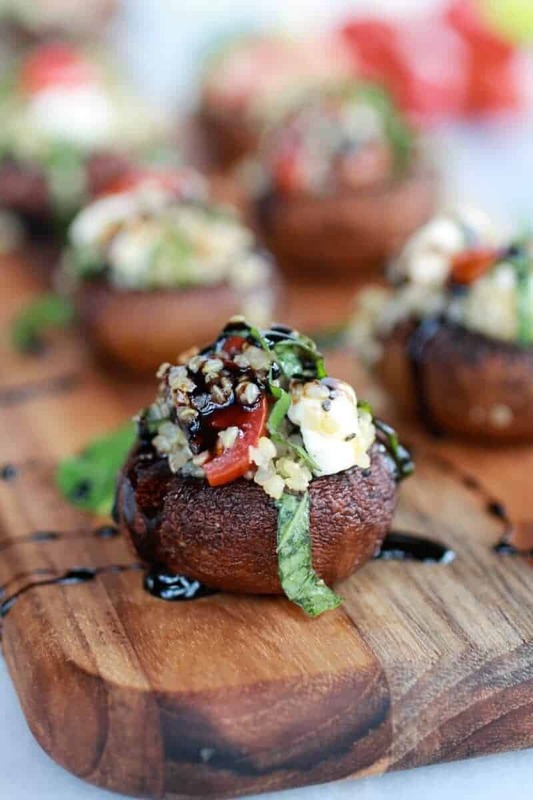 When the mushrooms are ready stuff each mushroom as best as you can with the caprese quinoa. 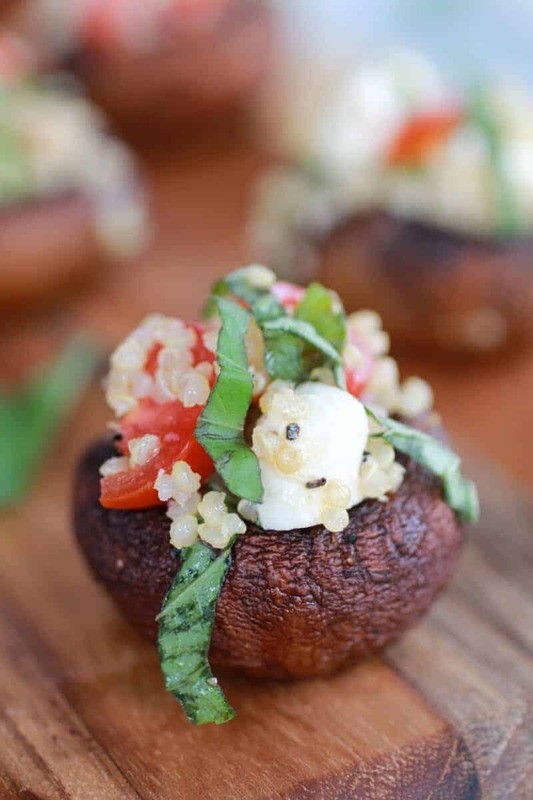 If your mushrooms are small you may have some of the caprese quinoa leftover, just serve it along side the mushrooms. If desired place the mushrooms on a baking sheet and place back on the grill or under the broiler for 30 seconds to 1 minute to warm the cheese. Serve with a drizzle of the balsamic glaze and fresh black pepper. So this is dinner tonight. Can’t you just taste it with your eyes! Yum! 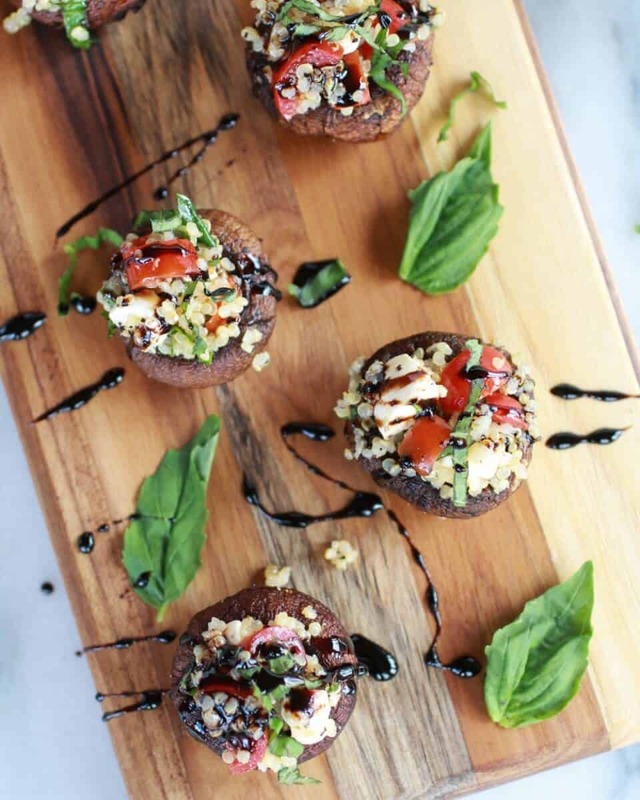 I love mushrooms, caprese, and quinoa, so can’t wait to try these! Thanks Nessa! Hope you Love them! Balsamic Glaze = what dreams are made of. These look fab! I know! Balsamic Glaze is SO good!! Thank you Erin! 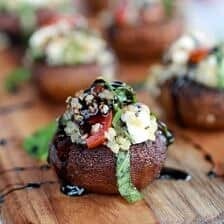 Caprese salad, quinoa and mushrooms are three of my favourites and this combines them all into one dish! I think caprese is one of the best summer flavors! Thanks Kevin! 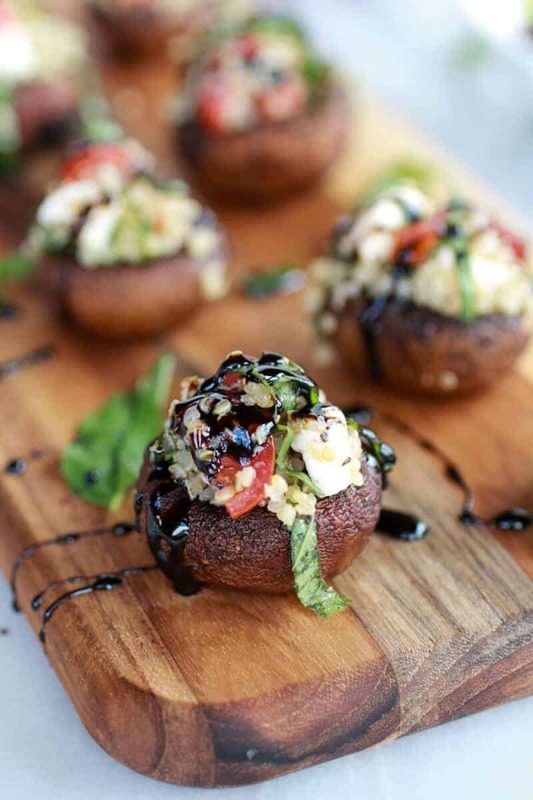 Caprese anything is a-okay by me and I love the idea of stuffed mushrooms. I wouldn’t complain about the vinegar smell…love the stuff! Wow! 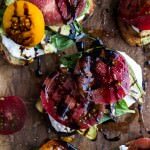 I love this idea for caprese and mushrooms and appetizers in general – absolutely fantastic recipe! And that photo of the balsamic glaze dripping down… get outta town! You are SO talented, Tieghan. Wow, thank you Georgia! You always have the nicest things to say! Thanks so much for reading! You had me at balsamic glaze!! Yum! These look fantastic!! I absolutely LOVE stuffed mushrooms :). I saw your mushrooms!! That dip looks addicting!! These are great straight out of the fridge!! Warm, cold or room temp! Ha! That sounds awesome I wish I had access to fresh herbs! YUM! Gorgeous photos!! I love all things mushrooms and caprese 🙂 killer recipe! These sound AMAZING! Anything caprese is great! My newest favorite thing is quinoa which I bet makes a great combination with the mushroom and cheese! I love to stuff TINY mushrooms! 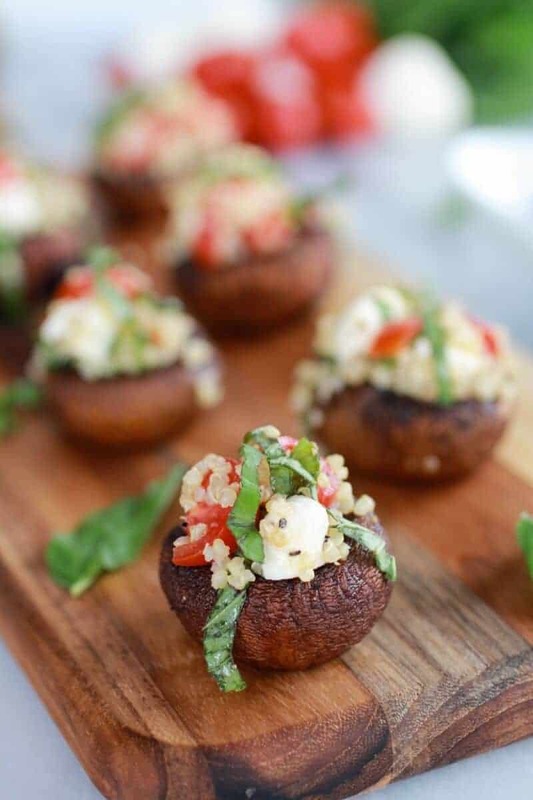 There is just something very special about serving those bite-sized portions of stuffed mushrooms! Quinoa stuffing sounds super delicious. Ha, I agree! Thanks Julia! this is genius. I likey!! I love mushrooms and eat them all the time! I love how adorable yours turned out 🙂 Little cute packages all stuffed and perfect! I am drooling! This look amazing! Basil is my favorite herb as well so anything caprese is perfect for me. 🙂 Thanks for sharing. Thanks Elizabeth!! Basil is awesome and summery! Hope you love these and thanks fo clicking over! Absolutely beautiful! These mushrooms sound amazing…welcome to world of grilled caps, you’ll never turn back now! Thank you Shannon!! And you are right grilled mushrooms are my new thing! There is no going back! These look so amazing. 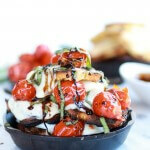 Love, love balsamic glaze on just about anything but paired with fresh mozzarella…oh yum. Thank you Wendy! Balsamic glaze is my favorite! What a lovely little appetizer! The combination of flavors sounds amazing! Thank you so much Tonia! Isn’t caprese the best?! So glad you finally made a caprese-themed dish. And dude, these mushrooms – GENIUS! Yes! it is so the best! Thanks Chung-Ah! I love mushrooms and this recipe looks delicious! Can’t wait to make a rendition of it. Thanks for the inspiration! Thanks for sharing these at Friday Flair link party! They look incredible! Now I just need an excuse to host a party so I can serve these! Saving the recipe for that very dinner party! 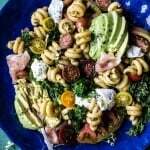 LOVE your recipes – you inspire me! Wow! Thank you, Ruth! You are too kind! So glad you like my recipes! Thank you Krista and thanks so much for pinning! Mushrooms are one of my most favorite ingredients! These look so good. I love mushrooms to, you can use them in so many ways! Wow these look amazing! Your photography is so gorgeous too. 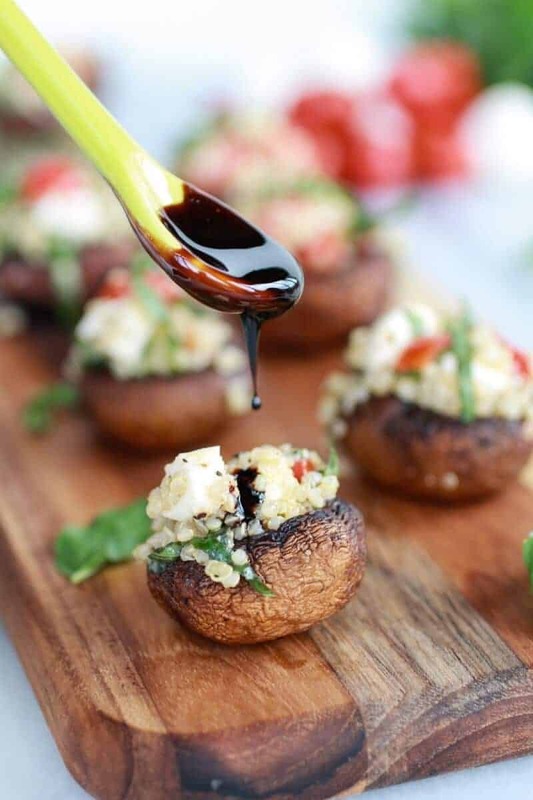 What a great idea for stuffed mushrooms and that balsamic glaze, oh my! Thanks for linking up with What’s Cookin’ Wednesday. These look amazing! Pinning for later! Stopping by from Marvelous Mondays, hope you’ll make a visit to my blog too! Thank you Rebecca and thank you for pinning! Hope you love these! What gorgeous photos! Really outstanding job all around and thank you for sharing! 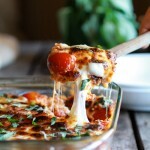 Can’t wait to make this!!!!! Wow, thanks so much Caitlin! Hope you love these! Sorry about the double // ! It is 1/3 cup of cheese. Hope you love these! You can buy balsamic glaze in the grocery store. This looks yummy and I cant wait to try it. Thank you so much, Heather!! Trust me I have bad dishes and the pictures to prove them! LOL! I would gobble those up in a heartbeat! Love the glaze over them! Thanks Angie! The Glaze is so yummy! These look awesome! Any chance you can fill me on where you got the wooden platter that you put these on? Thanks Heather! I order the platter from Amazon, here is the link to a similar one. I can’f find the one I bought. These mushrooms were fantastic! All the veggies used in this recipe came from the garden or farmer’s market (I love summer!). I used large portabellas and subbed the cheese for Follow Your Heart Vegan Gourmet mozzarella. The glaze put it over the top. So delicious! Thank you for this recipe! This is genius. I likey. Woah! I’m really digging the template/theme of the website. using this. Moreover, the blog loads very fast in my opinion on Opera. Thank you!! It was a huge switch for me!! So happy you like it!